Now after being in the financial industry for 23 years, I realize that there are a lot of people who bought RRSPs but don't really know why. Most people buy RRSPs for the tax deduction but that's a little short sighted. There's a little more to making good RRSP decisions than just getting a tax deduction. Remember that somewhere down the road, when you take the money out of the RRSP, you then have to pay tax right back to the government. So how do you know if you should buy RRSPs? How do you know if you are using RRSPs properly? How do you know if buying RRSPs is better than the Tax Free Savings Accounts (TFSA) or paying down debt? If your marginal tax rate (MTR) at the time of contribution is greater than your marginal tax rate at the time of withdrawal, then the RRSP will always give you a benefit. So what does all this mean? Firstly, you need to know about marginal tax rates. Marginal tax is simply the amount of tax paid on an additional dollar of income. As income rises, so does the tax rate. Your marginal tax rate determines the immediate benefit for the RRSP. For example, if I made $25,000 last year, my wife made $50,000, and you made $100,000 and we each decided to invest $1000 into the RRSP, I would save $250 in tax, my wife would save $320 and you would save $360 in tax. Despite investing the same $1000 we all get different tax benefits depending on our marginal tax rate. For marginal tax rates for provinces other than Alberta, DOWNLOAD 2014 TAX RATE CARD	(6768 downloads) . What will your marginal tax rate be when the money comes out? Not only do you need to know what your marginal tax rate is at the time of contribution but it would be advantageous to do some projections to see what your marginal tax rate might be when you are going to take the money our of the RRSP. Obviously, the ideal situation is to invest the money when you are in the highest marginal tax rate and then take the money out when you are in the lowest marginal tax rate. Let's say, you are in a 39% MTR and you invest $1000 into the RRSP. The government gives you $390 as a result of that RRSP contribution. But the government does not really give you the money, they are lending you the money because when you take $1000 out of the RRSP, then you have to pay tax. But if you are in a 25% MTR when you take the money out, you do not have to pay back the $390, you only have to pay back $250. That's a 14% benefit on top of any investment returns you may have made. That's how to use the RRSPs properly and to your advantage. On the other hand, you would be doing yourself a disservice if you put money in while you are in the lowest tax bracket and then taking it out in a higher tax bracket. Imagine putting in $1000 into the RRSP when you are in a 25% MTR but taking it out when you are in a 32%, 36% or 39% MTR. That's giving the government more of your hard earned money. How long before you draw money out of an RRSP? In this equation for evaluating the use of RRSPs, I have not considered the compounding effect of the tax-deferred income inside the RRSP. When you make money on the investments, you do not have to pay tax on the growth as long as the money stays inside the RRSP. The more time you have, the more valuable tax deferral and compounding become. For example, someone who is young and just starting to work may not be in a high tax bracket. Although their best earning years are ahead of them and they may be in higher tax brackets down the road, I would argue that the compounding effect of a long term tax deferral outweighs the value of the tax deduction. My advice to young people is to develop a long term savings habit by putting money into their RRSPs on a regular basis. Developing the habit of saving for the future instead of saving to spend is the best financial habit that you can develop. As you can see, most Canadians will benefit from using RRSPs. The value of the RRSP is not only determined by the tremendous tax deduction at the time of contribution but also other factors like your marginal tax rate at the time of withdrawal, the investment return over time, what you might invest in (capital gains vs interest vs dividend income), etc. In some cases, the RRSP will not make sense. In the end, the decision to buy RRSPs is a personal one. Ideally, the decision is made by developing a plan and doing some future income projection. Good luck! Since your MTR is around 25%, you’ll receive $25 for every $100 you contribute. I would consider putting as much as you are comfortable with in your RRSP and investing the refund in a TFSA for easier access. You can even consider splitting your contribution between a your own RRSP and a spousal RRSP to equalize retirement income, which will lower tax. This is not as important since you are now allowed to split pension income in retirement. UCCB is not considered income (since the last year! ); With income as yours and in your family situation, I wouldn’t put anything in the RRSP. 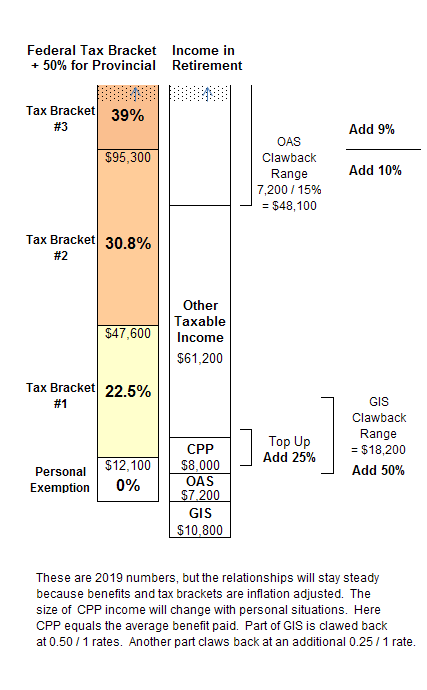 You are in a low tax bracket now and could be in a higher later. Save your contribution room for later and put your cash surplus (if any) into TFSA. Hope this helps! I use this scale to decide how much to contribute and I prefer to add to my TFSA. I just can’t decide what to do with my return that I will save this spring. Debt, RRSP or TFSA? I always waffle and end up splitting the money. I do take the first $100 of the return to blow on stuff we never have money for like steak and new underwear. I’m a fan of RRSPs but prefer to focus (meaning, max out) my TFSA instead. Another point to consider, if you want to retire early, there is a greater chance your MTR will be lower at time of withdrawal than during your contribution years. In this regard, it makes sense to put some money into the RRSP today and let the laws of compounding do their thing as often as they can. I do not mean to be a stickler, but there is no such thing as buying an RRSP as an RRSP is a type of account not an item to be purchased. People say the phrase ‘Buy RRSP’ in real life though. I think the point is that this is a good strategy to follow, no matter what investment you have in your RRSP. If you can delay the gratification a while, you can actually contribute to an RRSP while in a low tax bracket, and not claim the deduction till years later when you are in a higher tax bracket. It does mean you won’t get a tax refund until that later claim. This works best if you know you will be in a much higher tax bracket in a year or in a couple of years. For example, we have friends who knew that the wife would get a big bonus in 3 years when a delayed bonus would be paid to her at work. (She earned the bonus one year, but the company would not pay it unless she was still working with the company in 3 years time. Sneaky company!) So she knew in three years her tax rate would be higher as the bonus would make her skip up a tax bracket. She had already maxed out her TFSA though. She put the money in her RRSP to get the tax-free growth for the three years, then got the biggest tax refund she could by waiting to claim it. This might also be something to consider if someone is off on Parental Leave for most of one year (so low income, not a good tax refund for an RRSP contribution), have maxed out their TFSA and will be back at a high paying job the next year. They could contribute during the Leave year, but wait till the following year to make the deduction to maximize the tax refund. Either way, the important thing is to save it somewhere and not just spend it! you can over contribute to RRSP more than $2,000 at any time. The most important consideration not discussed is what the tax rates will be in the future! Do you think tax rates will go down? Not in my lifetime…… As governments around the world continue to print more and more money. Taxes can only go up! How far up is the question nobody has an answer for. I much prefer to max out my TFSA as it is not taxed when you make a withdrawal in the future. This is my number 1 priority. Anything left over goes between my cash account and my self directed RRSP account. The other important discussion is what to invest in……….. That is a whole different subject. I chose large cap blue chip that are way under value with a certain degree of certainty that they will be around for the next 100 years. Take for example BP oil. With a 4% dividend growing at 10% for the next 25 years. I am currently sitting at about 90% cash. I believe there will be a major correction aka crash within the next 2 years. There is no way things can continue to go up like they are with the fundamentals so messed up!! I highly suggest you read Rule # 1 by Phil Town. I would not just blindly buy any stocks right now. You must have a safety factor built in to your approach. I will not buy anything unless it is 50% below its intrinsic value. Sounds complicated but it isn’t. Phil teaches you how to do it. The real secret to investing is not losing money, ever! Hello, I currently have 2 jobs which fall in the Quebec tax bracket 11,196-41,095 or 28.53% MTG. But every year I have to pay more back than someone who has 1 job. Sometimes my total income is below 41095 and sometimes it is above, if it is above the MTG jumps to 32.53%. So my questions is how do I make sure I put enough into my RRSPs, so I don’t have to pay back $1500 to $2000 to the federal and Quebec governments. Last year I earned $41000 and I put in $4500 and I still owed Quebec $350. I got back $450 from federal. Is there a general rule of how much percentage of my income I should be contributing? Normally for those with 1 job they would contribute at least 10%. Hello, and thank you for the advice. This explains a lot for me. I do, however, have a question about the tax-free savings accounts: I am almost 40 and I have not yet invested in RRSP’s, is a tax-free savings account a better option for me? Also, you didn’t get into tax-free savings accounts but you did mention them, what would make them a better option than RRSP’s? And do you happen to have an article that could provide me with more information on this? Would I make more money investing in stocks or rrsps at the age of 33? With putting in 500.00 yo start at 50.00/month.? So currently I am 24 years making like 28 000$ .. what is a good amount to contribute to my rrsp? What should I look for when getting an account? At your age and income level the RRSP makes ZERO sense. The TFSA is a much better and more flexible alternative. 1) pay off the credit cards and all personal debt. 2) purchase the home you live in. In the long term, this is the best tax free Canadian wealth builder. 3) pay off the mortgage. 4) then look to the TFSA. 5) only then look to the RRSP. This financial plan worked well for me and my children. Great post, thanks! But the section titled “What will your marginal tax rate be when the money comes out?” doesn’t actually answer this question. Can you provide more details please? thanks! The post makes a lot sense! Thank you for good information. However one important part to be taken in consideration – the unofficial inflation rate. I mean how much actually the cost of living and the housing will rise. Remember, while your savings are tax sheltered, they are not protected against the ever rising costs. You will have much more by the time of your retirement, but will be able to buy much less. Therefore only extra income should be saved to RRSP. Hi, I am a new immigrant and would want to start investing. I am in the midst of trying to get familiar with all the Canadian financial lingo. As a starter like me (age 34, single), my projected gross annual income will be between $28,000 – $30,000 (depending on the hours rendered), what can you recommend for me to start on with? RRSP or TFSA or other investment tool? Please help. Thank you very much. I am also an immigrant, but twice your age. This financial plan worked well for me and my children. You have to be Canadian Citizen to open a RRSP. A person determined to be a non-resident of Canada for income tax purposes can hold a valid Social Insurance Number and be allowed to open a TFSA, however, any contributions made while a non-resident will be subject to a 1% tax for each month the contribution stays in the account. For more information see Non-residents of Canada. The problem is when you go on to claim that profits earned inside are only tax-deferred until withdrawal. In fact profits are always PERMANENTLY sheltered. On the diagram you can see the resulting $1,165 benefit that will always exactly equal the same permanent benefit from a TFSA. The idea that profits are taxed on withdrawal is a false conceptual model that ignores the tax effect of the original contribution. It will always exactly equal and offset what your conceptual model calls the ‘benefit from deferral’. This is the $2,391 number in the diagram. I just retired. Throughout my working life(municipal employee) I put away enough money into RRSP’s to give me a tax refund that would pay for my vacation. I didn’t know or think about the future or investing. I consider those vacations to have been an investment in my future, I worked in one of the most stressful of the emergency response fields. Life is more than the future after all. Now at retirement I have just less than 90k in rotating RRSP GIC’s. I now know I should have put all of my RRSP’s in Omers AVC’s that have been historically earning 11%. Oh well, now it is my pleasure to figure out how to remove them without incurring to much tax. I intend to defer my CPP for all the years I need. I followed your site for all of my retirement year but wish I had found you sooner. Thanks for great information.